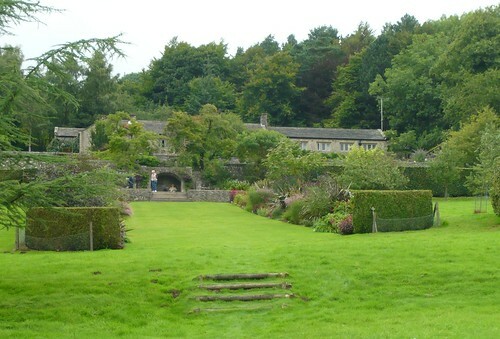 Parecvall Hall garden lies on a steep hillside near Appletreewick in the Yorkshire Dales National Park. Built in 1582 as a farm house it is now a retreat leased to the Diocese of Bradford by the Shrine of Our Lady of Walsingham. Extensively refurbished by Sir William Milner who bought the Parcevall Hall estate in 1927 he bequeathed the estate to the College of Guardians of the Shrine in 1960. Sir William was an architect and founder member and honorary director of the Northern Horticultural Society where he pioneered the establishment of Harlow Carr gardens, at Harrogate. Not surprising with Sir Williams background and passion for plants that the grounds today are a wonderful Gardens for the public to visit. 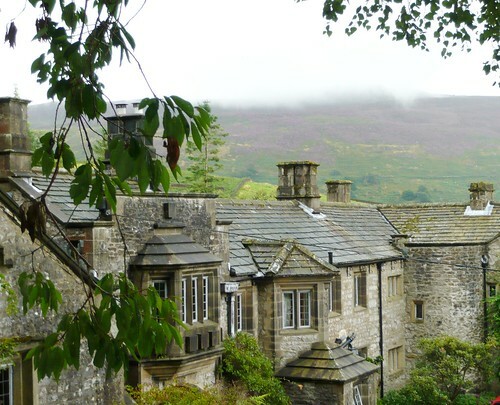 24 acres of formal and woodland gardens command impressive views of Simon’s Seat and Wharfedale. These features and the many planted trees create a microclimate that helps special plants to survive and thrive 800 feet above sea level. The view of the herbaceous border as you approach the house is flanked by two orchards of fruit trees containing some special Yorkshire apple varieties. All the hedges are neat and well maintained a tribute to the current head gardener and his helpers. The Alpine garden at the rear of the house houses acid loving and limestone loving plants in close harmony due to the rocky out crops in this part of the Skyreholme valley. I also noted that the numerous Hostas had not suffered any slug damage and the gardener put it down to the birds having a good feed. They were not the only ones having a good feed. 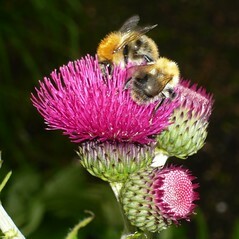 In addition to the bees above, the cafe down by the car park was doing a roaring trade. 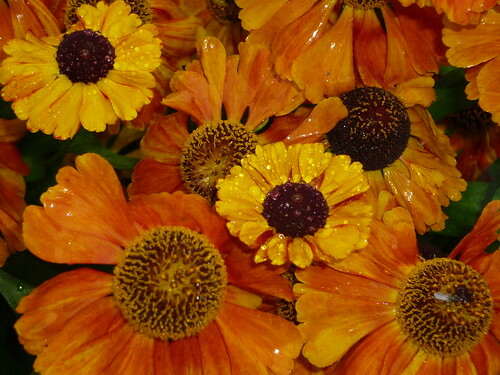 Despite the ‘liquid sunshine’ during my visit these Helenium made up for any negative feelings and the whole trip was tranquil, educational and positive. If you are invited on a retreat then it will undoubtedly be an experience. If you enjoy walking there are many places to visit close by including Trollers Gill, Stump Cross caves and Simons Seat. However for just an afternoon garden visit I can recommend the Parcevall Hall Gardens between May and August. You can buy A Guide to Parcevall Hall by Heather M. Beaumont from Yorkshire at Amazon containing highlights from 1984. Legend has it that this narrow limestone gorge of Trollers Gill is the haunt of the “Barguest” – the terrifying spectral hound of Craven (which is said to have “eyes as big as saucers”). I walked up the gill on my own. I could feel the hairs on the back of my neck stand up. And you have to try hard not to look over your shoulder.